In July 1998 Rachel Tyrrell returned from her honeymoon to start an exciting new job that included working with The Survey Association. She didn’t know it at the time, but she brought with her all the ability, skills and experience a trade organisation needed to thrive. Twenty years later, TSA’s manager is just as enthusiastic about every aspect of her role. You don’t have to be in the company of Rachel Tyrrell very long before she feels bound to tell you that she loves what she does. 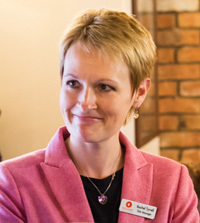 A forward thinker, committed to instigating and embracing change, Rachel has been at the centre of TSA’s evolution from a small, professional group, comprising 60 members, to a strategic organisation, with a membership of 181, comprising full, associate, affiliate, academic and supplier members. Managing the UK Land & Hydrographic Survey Association Ltd in 2018 is a multi-faceted operation, run by Harmony Business Support Services, which Rachel co-founded with Rory Stanbridge in 2006. A year later, in the wake of cuts to the Environment Agency’s budget, TSA hosted a planned event at the House of Commons to explain to MPs the importance of accurate survey data to mitigate against flood risk. Prior to 2006 the Shipbuilders & Shiprepairers Association (SSA) were contracted to provide Secretariat services for TSA, first from their office in London, and then briefly in Basingstoke and then in Egham. SSA Director and TSA Secretary General, Nick Granger was delighted to find that the energetic ‘self-starter’ he’d hired to oversee the office move to Egham was not only spotting where improvements in systems and processes could be made but was willing and able to tackle the changes herself. Attending her first TSA council meeting opened a window into the geospatial profession. Low fees and skills shortages were as high on the list of members’ concerns then, just as they are today. The former would lead to the launch of the TSA Surveying Course in 2001, a landmark in survey training, run at The Survey School in Worcester. ‘’I just listened and absorbed everything. When I started to understand the surveyor’s role, what really spoke to me was the pin- point accuracy of the work and the fundamental principles of surveying that underpin it. All the advanced technology doesn’t change the fact that you still need a surveyor to correctly interpret the data. Being spot on really appeals to my values and I don’t think surveyors blow their own trumpets nearly enough! In 1999, Rachel succeeded in convincing council members that TSA’s 21st anniversary should be celebrated with a big event. Nothing like it had happened before and just a year after joining the organisation it was a considerable responsibility to take on. Harmony employ six staff, spread between TSA offices in Newark and at The Survey School in Worcester. Being her own boss means that in any given week, Rachel could be visiting applicants seeking membership, representing TSA at industry events and meetings, designing promotional flyers and brochures, training staff or gathering feedback from the membership on key industry issues. Occasionally there’s even a chance to educate members on the dangers of stereotyping and to share her thoughts, in person and via social media, on the other passions in her life – Formula 1, football, cricket, photography, music and not least, her family and her Christian faith. She was elected Churchwarden this year, having served on St Swithin’s Parochial Church Council for two years. Equipping other people with new IT skills, she says is also satisfying. To apply for full and associate membership of TSA, surveying or measurement services must constitute at least 50 per cent of the company’s turnover. Samples of work, references and accounts are submitted. Comment and feedback from other members is sought on each application and fed back to the applicant. The next step is an assessment visit. Free business support services, supplied by Croner and MD Safety gives TSA members access to experts in employment law, PAYE and the health and safety legislation affecting surveyors – a boon for small companies. Ensuring a TSA member is the first choice for clients remains a key challenge. The annual GEOBusiness exhibition, Rachel says, is a huge leap forward for the profession and conversations are ongoing with the organisers to make it more client-focussed. As one of the supportive organisations, TSA is at the heart of those conversations.